While writing a response to a question, I came to a situation where making a sublist improved readability of the post. 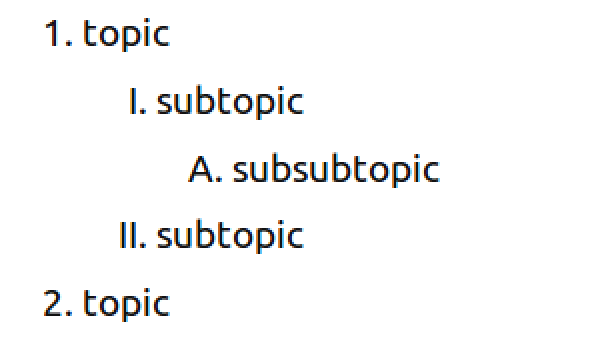 Although the indentation helps, this could present some confusion between topic and subtopic. However, it doesn't fit a formal text style. Attempts to create an alternate numbering for the sublist failed. This style is probably most appropriate for the case I encountered but isn't supported by HTML. It could be done with CSS, but I don't think is would be as easy as the next style. However, the page renderer here converts this to unordered lists. It seems that a minor edit and replication of existing code would enable the outline format. The ability to create sublists greatly improves the readability of complex explanations or multi step processes. To help the reader distinguish sublist from main list, the sublist should have a different numbering system. Kernel 4.0 and newer, the lazytime option reduces writes to disk by maintaining changes to inode timestamps (access, modification and creation times) only in memory. The on-disk timestamps are updated only when either (1) the file inode needs to be updated for some change unrelated to file timestamps, (2) a sync to disk occurs, (3) an undeleted inode is evicted from memory or (4) if more than 24 hours passed since the the last time the in-memory copy was written to disk. I could easily just write my answer as done above; however, would that start another bashing for not using the system's ordered list function? Granted the need for dropping to a third level in an answer does not occur often, but there is some need to do so in a thorough explanation. As shown by my examples of what works, the system already supports the needed elements except for differentiated numbering. A system enforced numbering scheme would be ok. Though, it seems that a user selected numbering would be easier to implement. I can see the merits to the style you are proposing. But we're not going to change our Markdown implementation to support them. For one thing, most posts don't need (or benefit from) deeply nested outlines, so this is a rather rare edge case at best. a. We aren't writing U.S. Code here. b. Maybe use actual code blocks instead. For another, Markdown has a pretty standard style of making lists. We'd rather move toward being more standard (perhaps by implementing CommonMark) than less standard. It'd be awesome if Markdown had standardized on a list style that matches the writing manuals you linked to, but that's not really what it's designed to do. I don't think most Stack Exchange answers or questions benefit from deeply-nested lists either, so we ought not encourage them. Doing something like this leads down a path I will (lovingly) refer to as formatting hell. In my personal opinion, not everything needs to be a list, and we shouldn't be encouraging sublists any more than necessary. We have better ways of splitting answers - those would (ideally) be better to use. You should use either blue or white orchids. Purple may be used, but results may vary based on the season. At the center of the semicircle, place a pure-white horse. Wave around a four-leaf clover while chanting "Invocum Unicornus Etat!" It can generally be assumed that users will read the entire post and be of sane mind. It's better (again, in my opinion) to make text and instructions smooth and simple rather than split things up into arbitrary steps. Get a unicorn to act as the magical catalyst. When the unicorn's horn begins to glow, pet the unicorn's mane while saying your wish. I really don't want to write this again, forgive me. Once the above two things are done, add the magical elixir to the unicorn's food. Wait for the unicorn's horn to start glowing. Once that happens, pet the unicorn's mane while reciting your wish. And this answer has gotten long, so I'll just summarize: sub-lists lettering will only put a bandage on an organizational problem already solved by other things (such as headings and different post structuring). While they'd be theoretically nice to have, I'd feel that at the end of the day they'd actually reduce readability. The sublists we have are already enough (and are denoted by indentations) -- more differentiation is not necessary as they really shouldn't be used unless there's no other choice. Not the answer you're looking for? Browse other questions tagged discussion feature-request status-declined text-formatting .